Adjust oven rack to lowest position and heat oven to 325 degrees. Line large roasting pan with aluminum foil. Using sharp knife score fat layer of ham at 1-inch intervals in crosshatch pattern. Combine 1 tablespoon dry mustard and pepper in small bowl. Rub pepper mixture over entire ham. Set ham on V-rack set inside prepared pan and cover pan tightly with foil. Bake until ham registers 140 degrees, 2 to 3 hours. Remove ham from oven and let rest for 5 minutes. Increase oven temperature to 450 degrees. 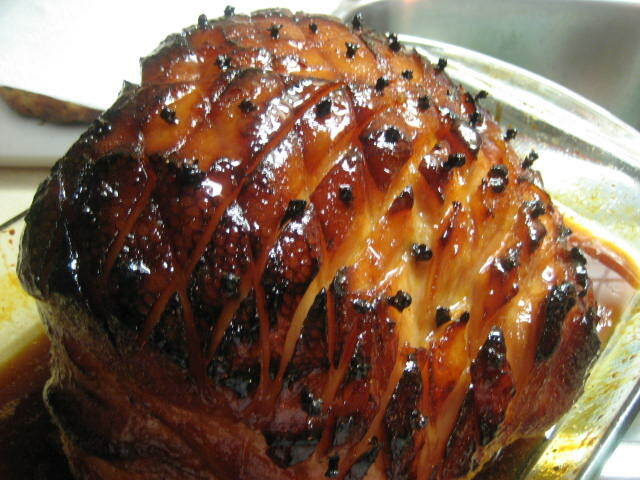 Discard foil and brush ham evenly with ½ cup glaze. Return ham to oven and bake until dark brown and caramelized, 25 to 30 minutes. Stir cider into remaining glaze. Transfer ham to carving board, tent loosely with foil, and let rest for 30 minutes. Carve ham and serve, passing glaze separately. End.